Scottish architects Page\Park have completed a centre for blinded sailors, soldiers and airmen in Wilkieston, Scotland. 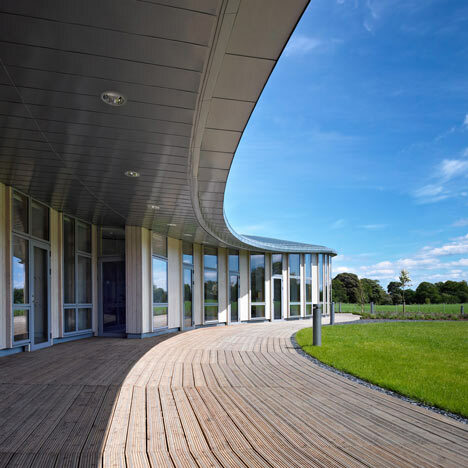 The single-storey Centre for Scottish War Blinded curls around the site and has an undulating zinc roof, inspired by a sculpture of a dragon found in the charity's existing facilities. Located on an adjacent site, the new day care and rehabilitation centre replaces the old buildings and includes a workshop, art space, training areas, a gym, therapy spaces and administration as well as a remembrance room and sensory garden. Photography is by Andrew Lee. Scottish War Blinded was founded in Edinburgh in 1915 with the object of caring for Scotland’s sailors, soldiers and airmen and women who were blinded in the service of their country. With the organisation now taking in a higher number of veterans of more recent conflicts, the Scottish War Blinded recognised that a new facility was required so that the scope and quality of the services they offer could be improved. Their new 750m2 facility is located on an inspiring site at Linburn, West Lothian and replaces the charity’s 1950’s facility which occupied an adjacent site. The scheme takes inspiration from a hand-carved Chinese celestial dragon memorial sculpture which was housed in the display room of the previous facility. This inspiration manifests itself in the sweeping and twisting geometry of the building’s undulating zinc roof. The building operates as a day care centre and offers a comfortable and sociable environment whilst also providing rehabilitation and life skills assistance for ex-servicemen and women suffering from visual impairments. Facilities include a workshop, art space, training areas, a gym, therapy spaces and administration as well as a remembrance room. A terrace and landscaped sensory garden to the south of the building is also provided for recreational use in addition to education. The shifting demographic of users that the organisation now supports has influenced this broad mixture of activities. The building harbours a strong focus on internal flow, with a mainly open plan arrangement fed by one, generous circulation spine. The accommodation is organised so that the circulation and larger spaces are placed near the external walls, while smaller, ancillary spaces requiring enclosure, privacy and acoustic insulation are placed in ‘pod’ elements nearer the centre of the plan. The organisation of the building aims to be as simple as possible so that the users can easily form a mental picture of the building, thus allowing straightforward navigation. In addition, bold gestures (both architecturally and through the use of colour) are made at doorways and changes of direction to further assist building users’ wayfinding. The curving geometry has been formed by the use of steel portal frames set out on a radial grid and in-filled with cold rolled purlins. The twists and sweeps of the geometry have been formed by gentle facets, with the steel frame only including two relatively short curved structural members. A restrained palette of materials are used throughout the building to clad the steel structure beneath. The roof is formed in zinc strips with the external walls clad in timber panels set out alongside large glazed openings. Internally, the ‘pod’ type spaces are picked out in oak and detailed to sit like pieces of furniture under the large twisting roof. Given the nature of the Client, inclusive design was at the forefront of our thoughts from the very start. With the building users having visual impairments of varying degrees, in addition to many of the users being elderly, careful consideration had to be given to a number of key areas of the scheme. As a team we had to go much further than simply meeting the DDA requirements. Advice was received from Adapt Access Services in addition to members of the War Blinded Client group. Firstly, the building and surrounding garden are all on one level so as to allow full access to wheelchair users. In addition to this, there are ultra low-profile thresholds throughout the building so as to avoid any potential trip hazards. Inside the building, the primary circulation route is a generous width and has a continuous handrail down one side to provide support where required in addition to acting as a guide to the visually impaired. Where access to rooms occur off this corridor, bold gestures have been made at these locations both in the layout and in terms of the colours used on the walls. By studying the Light Reflectance Values (LRV) of each of the finishes (floors, timber panelling, door laminate, ceiling), this allowed us to carefully select the colours of the painted slots at these access points so as to provide sufficient visual contrast. From the onset the design of the new centre for the Scottish War Blinded was based on sustainable principles. Natural ventilation is utilised in the majority of the spaces and heating is supplied from a ground source heat pump. In order to minimise energy requirements, high levels of insulation and air tightness have been designed in to the building envelope. In addition, carefully controlled amounts of glazing have been provided, balancing the need for pulling light deep in to the plan with the need to control glare and solar gain / heat loss.